The National Institute of Standards and Technology Genome Editing Consortium addresses the measurements and standards needed to increase confidence and lower the risk of utilizing genome editing technologies in research and commercial products. Targeted genome editing, a method used to alter the DNA of living cells at desired locations, is poised to revolutionize science and medicine. To fight diseases, novel genome edited therapeutics, including those for use in regenerative medicine and infectious diseases, are being developed. Many commercial applications including agriculture and chemical production, are also leveraging this technology. Whether genome editing will be used in healthcare, agriculture or basic research, robust quantitative measurements are needed to enable high confidence characterization of DNA alterations. NIST has brought together experts across the genome editing field including stakeholders in industry, academia and government to assess their measurement needs. These discussions have identified common pre-competitive measurements and standards needed to establish greater confidence in the characterization of genome editing outputs. The NIST-led Genome Editing Consortium has been established to address these needs. Design, generate, and evaluate a set of purified DNA spike-in control materials that can be used to mimic both induced on-target and off-target variants at known frequencies in a background of human genomic DNA. The DNA spike-in control materials will be used as a benchmark for validation of next-generation sequencing (NGS) pipelines and other platforms intended to identify induced genome editing events. Design and conduct controlled evaluations of existing assays for quantifying on- and off-target genome editing, with a robust and optimal experimental design aimed at assessing the sources of variability, repeatability, and reproducibility within an assay. 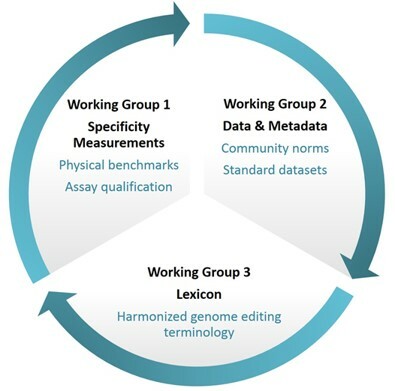 Identify community norms for data formats and tools for benchmarking data analysis including in silico and experimental data sets. Determine the type of metadata that would be needed to be shared, housed, and interrogated from genome editing experiments. Identify terms and related definitions to form a common genome editing community lexicon. 65 participants at the 2016 NIST Genome Editing Standards Workshop identified pre-competitive standards and measurements needed to establish greater confidence in characterization of genome editing outputs.